Two Guardians of the Galaxy movies, part of the Marvel Cinematic Universe (MCU), have been released to date, with both focusing on Peter Quill (portrayed by Chris Pratt) and the group of extraterrestrial misfits he joins forces with. 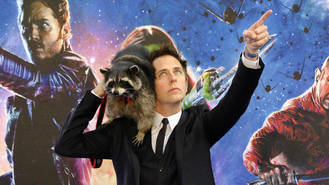 Writer and director James Gunn is already working on a third instalment, and delighted fans over the weekend (09-10Sep17) when he announced Rocket is getting his own spin-off film. "As you know, the MCU is one way of processing these characters. 616 is a different one. We are going to learn more about where Rocket comes from in the coming sagas," he told the crowd at Hasbro's HasCon event, according to Cinema Blend. "It's going to be a little different from the comics. We already know a lot about from where he came from. It's a little bit more horrible than what it is in the comics when you come down to it. We will learn more about that." Earth-616 is the primary continuity in which most Marvel Comics titles take place. Before James gets to work on a new Marvel instalment, Bradley can be heard as Rocket in next year's Avengers: Infinity War. It marks the first time the Guardians of the Galaxy characters have teamed up with Marvel favourites like Iron Man, Thor, and Captain America, played by Robert Downey Jr., Chris Hemsworth, and Chris Evans, respectively. And motion reference actor Sean Gunn, James' brother, is back bringing Rocket to life. "Sean Gunn is not a stand-in. He is a motion reference actor," James previously stated. "That means we film everything Sean does on set as Rocket. We film it. I don't stop doing takes of him until we get the performance right and then we use that performance as a basis for much of Rocket's acting. And he does a fantastic job in that role. He knows it. He understands it." Sean also plays Kraglin in the franchise.